behind mommy lines: Where Do I Even Begin? Earlier this week, I was a space cadet, first class. The end of the week, I was hyper, strung out, worried Mama. You see, I am trying to be a chill Mom. I am desperately trying not to be the Mom that leaves a million messages at the pediatrician's office over a cough or a sneeze. I am trying so hard to not hit the panic button too soon. One frantic call to the pediatrician's office later, and I was coaxing my three year old to pee in a cup. The good news? Her pee test came out normal. However, one question about the family history, and the doc was writing up lab orders for blood tests- just to be sure. Nothing to worry about too much. Then she went about her routine doctor-y stuff. Check the ears, stick out the tongue. Etcetera. My red alert level had mellowed down to a yellow. Things seemed to be ok. I was just paranoid. I can live with that. Then, after listening to Squirt's heart, she told me she'd heard a murmur. (cue heart sinking) It could be nothing. But it could be something. A referral to a Cardiologist was in the works. So we walked in there with a possible diabetes problem, we walked out with a blood draw order and a future Pediatric Cardiologist appointment. I was pretty sure it wasn't going to get any worse. I wasn't looking forward to the blood draw. Oh no. What I did not realize was the speedy "online booking process" would mean the only morning appointment available (had to be morning- fasting was required) would be about 3+ weeks away. (cue ominous music) Ugh. I simply could not put this worry on the backburner for three whole weeks. That would have caused me to need a Cardiologist of my own. Determined, I woke up a sleeping Squirt at 6am to try and be first in line when the blood draw place opened at 7. I had hyped it all up the day before. There would be lollipops a plenty. Turns out the place opens before 7am, and upon arriving there at 6:30, there was already a ton of people in the waiting room. I was going to have to bring out the big guns. When our name was called for paperwork processing, I marched up with a very tired and pathetic looking Squirt in my arms. The lady asked "is this for you?" No, ma'am! This is for the very tiny, very adorable little bundle here. Yep. That did it. Our file went straight to the top of the pile. The next one called back was my brave little Squirt. She was so brave, dear audience. There was no crying, there was no squirming. 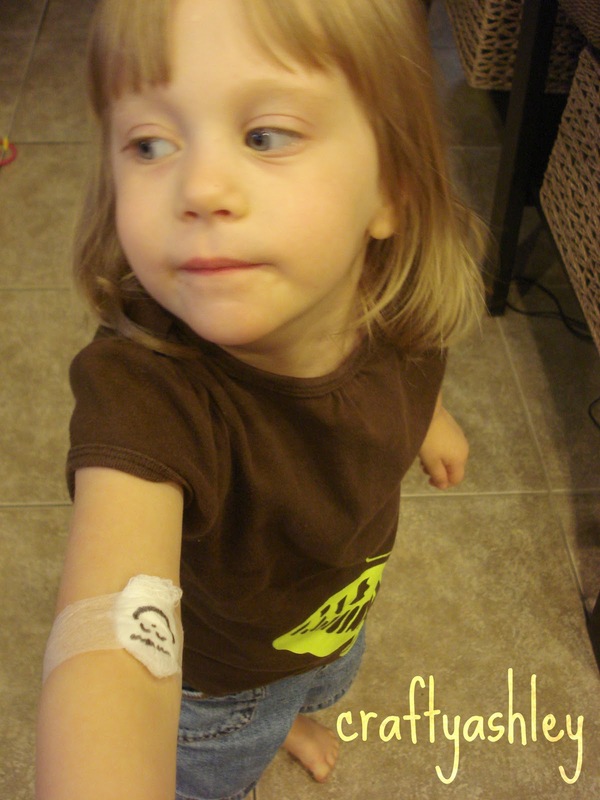 She wouldn't look the phlebotomist straight in the face, (who could ask that of her anyway!) but she did just grand. Even when the guy couldn't exactly tap into her tiny veins and was wiggling the needle around in there, (Mommy almost passed out) she was still and quiet. And was rewarded with a smiley face drawing on her bandage. We'd been through a lot, and my poor little emotions were weary. As my cell phone rang on the drive home, I made big plans (assuming it was The Husband) to head to Mimi's for stuffed french toast. French toast all around! That was, until I heard The Husband's voice on the other line, "We have a problem." What could it possibly be now. I just got through all the hard parts! Leave me alone! "The Bunny just puked all over her bed. It still looks like the cottage cheese she ate last night. Oh, and... could you come wash the sheets?"